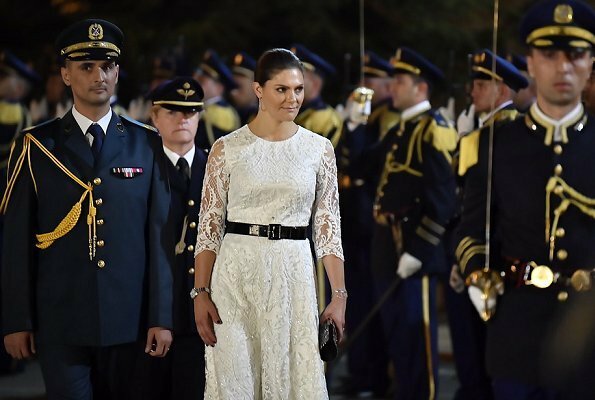 Crown Princess Victoria and Prince Daniel of Sweden arrived in Beirut today. 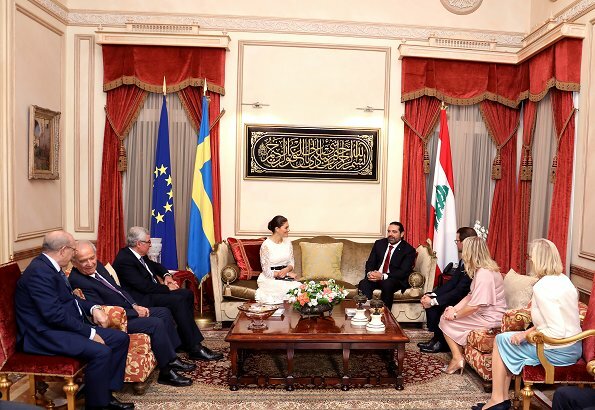 The Crown Princess couple were welcomed by Minister of State for Women's Affairs, Jean Ogassapian and the Swedish ambassador to Lebanon, Jorgen Lindstrom at the Rafic Hariri International Airport in Beirut, Lebanon. 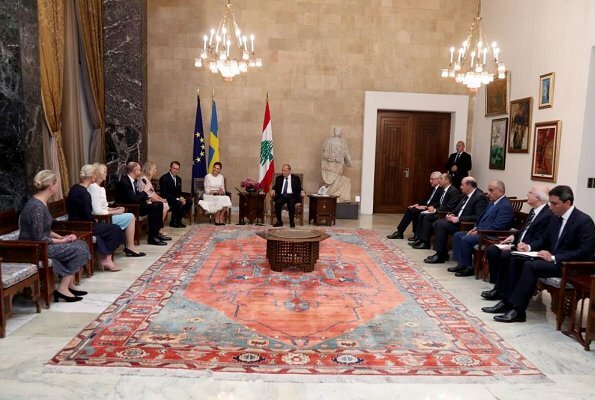 President of Lebanon, General Michel Aoun welcomed the Crown Princess couple with a welcoming ceremony held at Baabda Palace in Beirut. 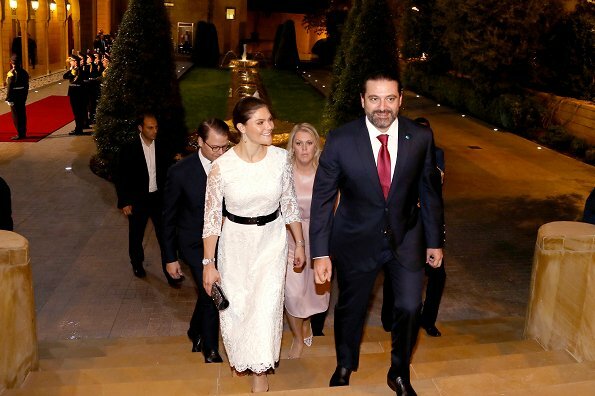 Afterwards, Crown Princess couple visited Lebanese Prime Minister Saad Hariri, at Grand Serail in Beirut. Pretty dresses but I don't like that black belt. Athen dress the CP is wearing on the first picture is stunning. About her hair has been spoken so often, I would love to see her with her hair down. The grey dress is very grey (and fussy). The white dress is nice and CP Victoria looks great in it. I like both dresses. The gray one would have looked better with strong color shoes and bag the white one is splendid she Victoria looks great. I love both dresses and wish we could see more of the grey dress. They fit very well and are quite regal in tone. I think that the plain black belt is out of place on such a feminine style. Maybe a silver belt twisted with a black, narrower one would look better? Actually all of her outfits on this trip have been a treat to see. So often the remarks about her flowery choices seem to ignore the masculine effect her chin has. Do you think she wears the flowers to appear more feminine? Her jaw line/chin seem to be strong, because she wears her hair up most of the time. If she wore it down, and around her shoulders, the chin/jaw line would sort of disappear. There is no masculine effect, she is a total beauty, inside and out. Both dresses she wore today were equally attractive, each in their own manner. I preferred the white one, but it was simply a personal impression. She wears all of her outfits with dignity and grace, radiating from the inside out. When Victoria's hair are down, her jaw line look even bigger. But agree with K H -- Victoria's severe hairstyle and strong jaw line make her look masculine (which is never good thing on a woman, unless she want to look masculine for whatever reason?). She needs more volume on the top to balance her big jawline. But instead she flatten her hair as flat/down as possible. I don't think she's total beauty. 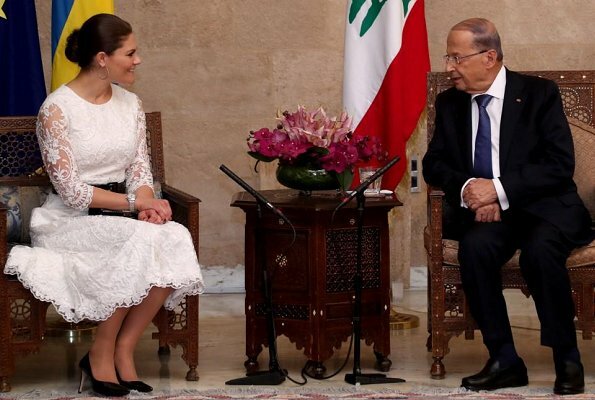 I like both dresses, she looks very feminine and also royal. Being in that part of the world, Victoria is wise to keep her skirts a little longer. I love the idea of a stronger shoe with the grey dress, maybe a wine color, as Anon 3:30 suggested. The white dress needed a belt to define her waist, though it didn't need to be such a bold choice. Regarding the conversation about her jaw line: She does have a strong jaw line. It does not mean she is not a beautiful woman. As we have discussed before, she accentuates it by wearing her hair pulled back. The eye has nowhere else to go. As with Maxima, it has nothing to do with her dedication or the work she does. She has to cut her hair,she is not a teenager anymore.Actually her hair is too long,but I can say I admire her sens of duty and her active presence. Both dresses are very elegant. I like the cut of the grey dress more than the white one. The white dress makes no good line at her shoulders and her waist. I wish we could see more of the fabric of the grey dress. Some women do have a stronger chin, but I think it is not just the jawline it is the neck. 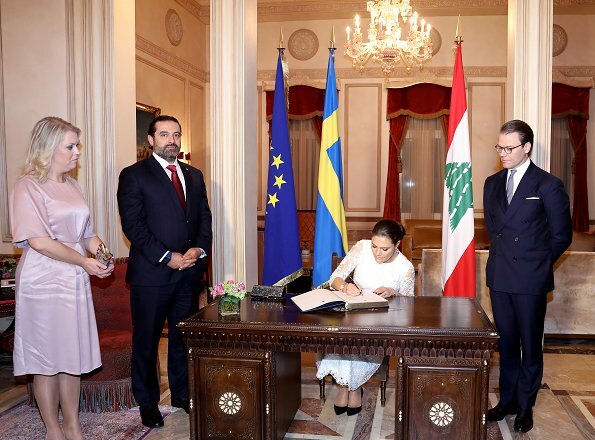 She should wear her hair down like chardonn8r and Anonym. wrote. Not nice wearing the hair like that and the dresses,oh no! I like the grey dress a lot. The white is not my favorite. White lace looks little bit too bridal, I think. But Victoria and Daniel are great ambassadors for Sweden.